We are in the middle of graduation season, with ceremonies happening all across the country as the newly educated hit the real world. It is inevitable that there will be one or two commencement speakers who will say something that goes viral and will lead to people sharing all the commencement speeches of the past. 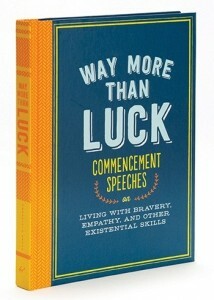 Well, to help prepare you to be part of this annual exchange, I have found the book, Way More than Luck – Commencement Speeches on Living with Bravery, Empathy, and Other Existential Skills, an anthology of some of the best commencement in recent history. I remember many of the speeches I have heard at commencements over the years, and it is fun to flip through this book to see how speakers have used the opportunity to impact the lives of graduates over the years. Way More Than Luck is available from Amazon and other fine booksellers. Lost Cowboy is powered by	WordPress 5.0.4 and delivered to you in 0.811 seconds using 45 queries.